Goodreads says, "Darcy Fitzwilliam is 29, beautiful, successful, and brilliant. She dates hedge funders and basketball stars and is never without her three cellphones—one for work, one for play, and one to throw at her assistant (just kidding). Darcy’s never fallen in love, never has time for anyone else’s drama, and never goes home for Christmas if she can help it. But when her mother falls ill, she comes home to Pemberley, Ohio, to spend the season with her dad and little brother. Her parents throw their annual Christmas bash, where she meets one Luke Bennet, the smart, sardonic slacker son of their neighbor. Luke is 32 and has never left home. He’s a carpenter and makes beautiful furniture, and is content with his simple life. He comes from a family of five brothers, each one less ambitious than the other. When Darcy and Luke fall into bed after too many eggnogs, Darcy thinks it’s just another one night stand. But why can’t she stop thinking of Luke? What is it about him? And can she fall in love, or will her pride and his prejudice against big-city girls stand in their way?" Darcy Fitzwilliam is one of the most successful women in Manhattan. Her life is perfect except for the fact that she isn't in love. Sure, she has a "sort of" boyfriend, but he isn't someone she truly loves. Does she even have time for a real relationship? Another Christmas is here and she plans on staying in the city and not visiting her family once again, but this year she gets a call that her mother has suffered a heart attack. Darcy decides to return home to Ohio and spend Christmas with her family and although this should be no big deal, it's stressful for Darcy, because she is returning home to all the people she left behind and some people she'd rather forget about. Her parents always throw a Christmas party and while there she is reunited with Luke Bennet and the rest of his boring and average brothers. While indulging in one too many eggnogs at the Christmas party, she makes out with Luke and her current "sort of" boyfriend finds out. Cue all the drama. On top of it, Darcy must make amends with her family as her absence as created a major hole in their family's world. Pride and Prejudice and Mistletoe is a quick and cute Christmas read; it's a fun, modern twist on the classic. I have to admit I really didn't like Darcy too much in Pride and Prejudice and Mistletoe. She's one of those super successful and very superficial businesswomen from New York City. She sort of felt like a cliche to me, but once she was back home in Ohio, I started to like her more. Darcy made some stupid decisions, but I think that was part of the fun. After all, we know where the story is heading as there are no surprises, but it was still an enjoyable ride. Luke Bennet is no Elizabeth Bennet by any means, but I did like his character more than Darcy. He has his own baggage and relationship with Charlotte, so it was fun trying to figure out how that would play out. The gender swap of Luke Bennet being the "Elizabeth" in the story is also a clever adaptation. 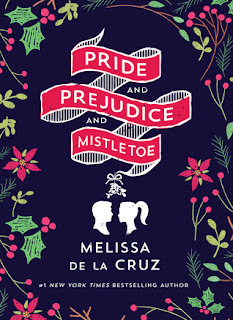 If you are looking for a cute holiday story that is light, quick, and a twist on Jane Austen's Pride and Prejudice, definitely give Pride and Prejudice and Mistletoe a try this winter. It's not my favorite Austen retelling by any means, but it's still a great way to spend a lazy weekend. I think it's a great book if you want to relax ! It definitely is! Perfect for the holidays when things get busy and stressful. Thanks for visiting, Alex. I have this one on my TBR - I don't read a ton of holiday-themed books, but after reading Pride and Prejudice last year (finally), I've kind of been on a P&P retellings kick, and I think this will be a cute holiday story. It definitely is! It's a fun and very modern twist. I hope you enjoy it! Thanks for visiting, Angela. Yes, I agree. Sometimes I struggle with the retellings, but this one was light and fun...not to be taken seriously at all. It would be fun over "Christmas Break," I agree. Thanks for visiting, Lark!